You are here: Home › Rainwater Tanks › What Size Rainwater Tank Do I Need? 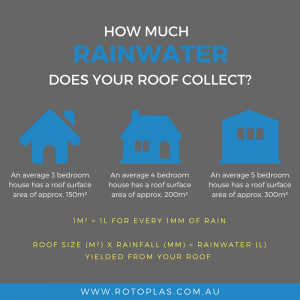 If you’re building a new home, or have recently deciding to invest in the worthwhile activity of rainwater harvesting, you may well be wondering ‘what size rainwater tank do I need?’ There are four main factors to consider when you are choosing a rainwater tank. These are your average rainfall, roof size, regulatory requirements, and likely usage. Wherever you live, your average annual rainfall will determine how much rainwater you can possibly harvest in a year. If you have a very wet climate, you will require a large enough capacity to be able to catch it, whereas if you live in a dry area, you will not see as much rain and therefore require a smaller tank. If you experience very seasonal rainfall, you will need sufficient capacity to be able to fill your tank in the wet season and last throughout the dry season. 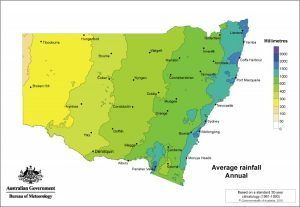 The map below, published by the Bureau of Meteorology, shows the average annual rainfall in NSW based on the averages of a 30 year climatology from 1961-1990. The surface area of your roof (or rainwater collection area) equates to the rainwater runoff that will yield, so it is an important indicator of what size rainwater tank you will need. Once you have an approximate measurement of your rainwater collection area in square metres, you can calculate this to litres of rainwater using the following simple ratio. 1m² = 1L for every 1mm of rain, that is, roof size (in m²) x millimetres of rain = litres of rainwater yielded from your roof. Particularly if you are building a new home and require a BASIX certificate, there are various council requirements that will impact upon the rainwater capacity you will require. These requirements may vary according to the location, size and type of your home and what you will be using your rainwater for. Council may require a minimum or maximum volume, and may impose certain height or width restrictions. 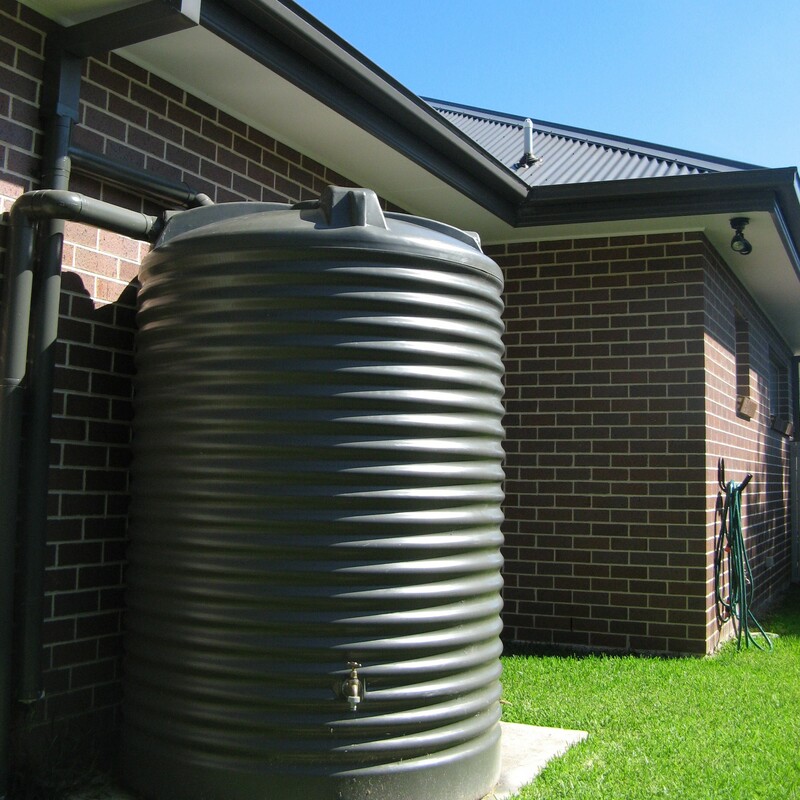 In addition to planning requirements, there may also be plumbing/installation requirements and health requirements, which could impact your choice of rainwater tank. If you are unsure what your relevant regulatory requirements are, you should contact your local council. Your usage requirements depend on what you will be using your rainwater for, household occupants, and the water efficiency of your fixtures. For example, if you are connecting your rainwater tank to your laundry only, you will require less capacity than if you are connecting to your laundry, kitchen and three bathrooms. You will require even greater volume if you are also planning on washing your car with your rainwater supply every week, or have a herb garden which you will be watering every second day. Whatever your situation, you should factor in your approximate water usage. A quick way to determine this amount is by examining your most recent water bill. Still not sure what size is best for you? Give us a call on 1800 218 000 and speak to one of our helpful experts!